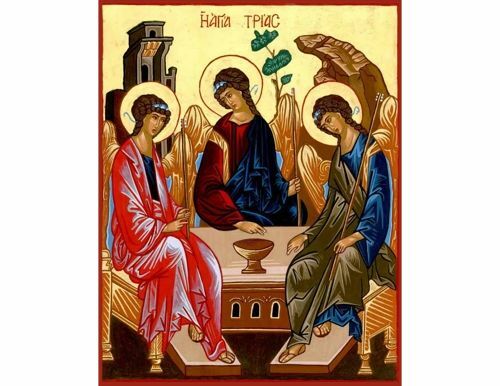 An exquisite Greek Orthodox Icon of the Holy Trinity, handmade & handpainted by an expert Greek hagiographer. The icon was created by Russian painter Andrei Rublev in the 15th century. It is regarded as one of the highest achievements of Russian art. It depicts the Holy Trinity in the form of the three angels who visited Abraham at the oak of Mamre (Genesis 18,1-15).